sweet potatoes are rich source of flavonoid anti-oxidants, vitamins, minerals, and dietary fiber that are essential for optimal health. Contain 65% of daily amount of Vitamin C. + high in calcium, folate, potassium and beta-carotene. They have a low glycemic index (impacton blood sugar levels) at 17 (white potato 29). 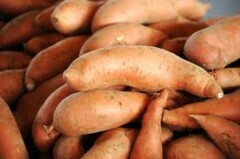 High levels of Vitamin A and beta-carotene means sweet potatoes are a skin superfood. The substances on many pricey skin-care products like retinol and retinoic acid are derived from Vitamin A. Plus beta-carotene combats free radicals which result skin aging. High potassium content means sweet potatoes can alleviate muscle cramps. During times of stress, the body uses more potassium, so eating sweet potatoes can help protect you from the negative health effects of tension. S-ah-weet! Sometimes we come across a recipe that, like a phone booth, turns you from dinner schlub into culinary hero. And like that phone booth, which would be an apple store today, this one takes less effort than it took me to put the accent grave & circumflex marks of crème fraîche into this post. So little effort that if you don’t want to make the sauce, we have an almost comparable way to get the same flavors with a pinch of your fingers. Let’s start with the recipe above from Ottolenghi, you know the Jerusalem author; only this recipe is out of his Plenty cookbook. The sweet potatoes, pure gold in their own right, are baked in an two-part seasoning mixture. Before serving, we top the sweet potatoes with cilantro leaves and finely diced red chili pepper (Fresno or Thai are my favorite – the only thing the two locations have in common). This sauce could make a dishcloth palatable and I implore you to make the attempt. 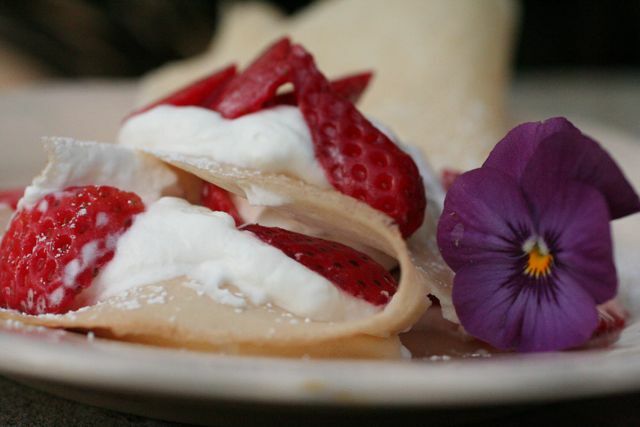 If you’re not into the hassle or want to avoid crème fraîche and it’s accent graves and circumflexes, you simply spritz the baked wedges with lime juice before adding garnishes. That’s right, lime juice. The balance between the sweetness of the potatoes and the tartness of lime juice creates tastebud magic. 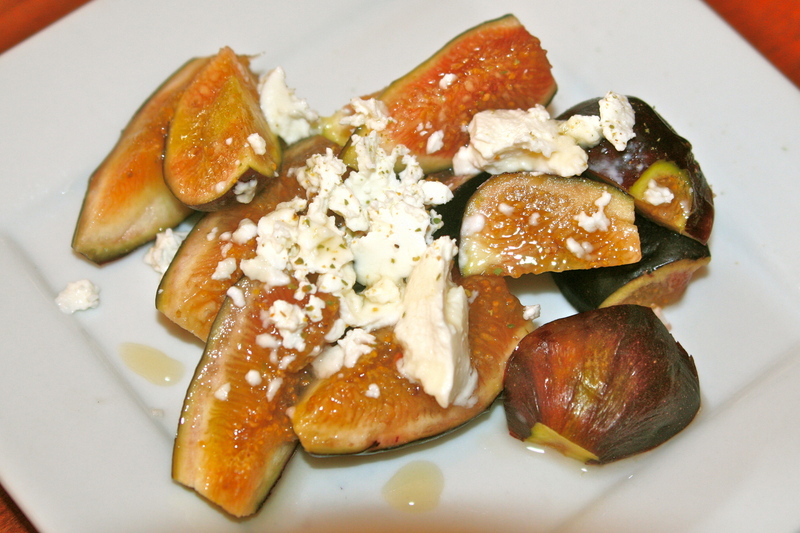 Make this tonight!!! Wash, but don’t peel, sweet potatoes. Cut each into wedges the lengthwise. Eight wedges per potato ideal, but if you have kids who don’t like too much potato with their baked outer edge, go smaller. Place wedges in roasting pan that has been lined with parchment paper (or is non-stick, or a silpat). Brush lightly with oil. 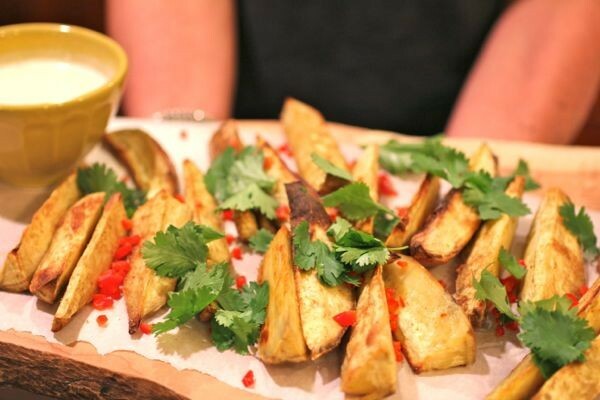 Brush the wedges with remaining oil and sprinkle with the mixture of ground coriander and salt. Roast for about 25-35 minutes depending on your oven and need for kid-friendly crispness. When ready to serve, move wedges to a serving platter and *top with cilantro and diced chile; serve with sauce on the side. *This would be the point to spritz with lime juice. grated zest and juice of two limes. Very finely chope the lemongrass or grind it finely in a spice grinder. Whisk with all of the other ingredients for the dipping sauce and set aside.